A smart assessment solution for institutions, Addmen Online Test Solution is equipped with an array of features such as support for bi-lingual question papers, online candidate registration, user test log monitoring etc. The software supports SMS & email based user credentials and also features an online score board which displays the results on a website. It is the perfect option for education institutions looking for testing solutions at an affordable price. Addmen is an OMR, OCR and ICR software solution company that provides complete modular Institute Management Software and Integrated Assessment Suite. These software suites help to fulfill the education and assessment requirements of the organization. Addmen is a 15 year old company which has crossed almost 4000 users for its software. OMR software’s are offered in over 20 countries to name some Middle East and Africa having our OMR users in UAE, Saudi Arabia, Bahrain, Qatar, Kuwait, Egypt, Iraq, Syria, Yemen, Sudan, South Africa, Tanzania and Nigeria, India and more. It is suited for simple MCQ type test pattern like IBPS; NEET etc. It is suited for exam patterns like IIT; SAT;NATA etc. 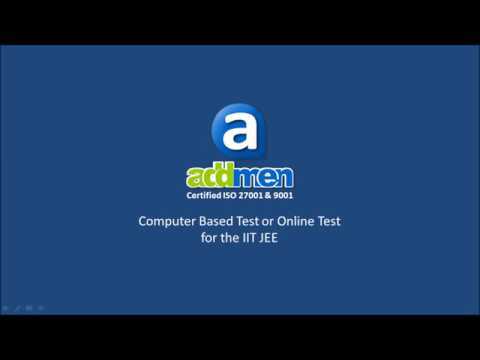 This video shows how the Addmen Integrated Assessment Suite can be utilized to be conducting Computer-based Test or Online Test for the IIT JEE preparation. With Addmen Integrated Assessment Suite, it can possible to conduct a paper-based test on OMR sheet as it also has an OMR module. This software has a series of online practice test series, which will assist you to measure your preparation at each stage and Prepare you ready for the actual JEE Main Online exam.